Dylan Hysen and Delaney Stovall discuss the latest episode of the English dub of Miraculous Ladybug, “Darkblade”. Dylan Hysen and Delaney Stovall discuss the latest episode of the English dub of Miraculous Ladybug, “Horrificator”. Dylan Hysen and Delaney Stovall discuss the latest episode of the English dub of Miraculous Ladybug, “Dark Cupid”. 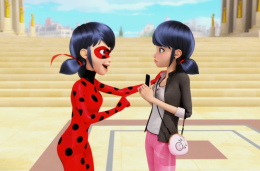 Dylan Hysen and Delaney Stovall discuss the latest episode of the English dub of Miraculous Ladybug, “Rogercop”. Dylan Hysen and Delaney Stovall discuss the latest episode of the English dub of Miraculous Ladybug, “The Evillustrator”. Dylan Hysen and Delaney Stovall discuss the latest episode of the English dub of Miraculous Ladybug, “Stormy Weather”. Dylan Hysen and Delaney Stovall discuss the latest episode of the English dub of Miraculous Ladybug, “Mr. Pigeon”.